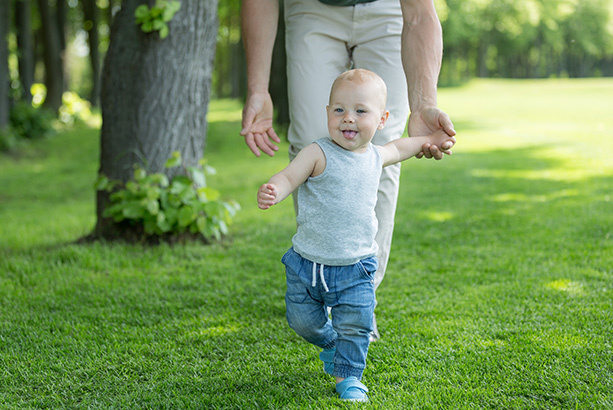 Babies begin to walk when their muscular structure and nervous system are developed and mature enough to sustain the physical toll of walking, and when they're psychologically ready to brave the challenge. 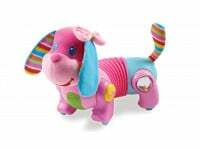 Certain babies may shy away from the attempt, because they are either naturally inclined to be more cautious or lack self-confidence. Encourage your baby by offering to push a stroller and be there for the process, but of course, there's no need to force the issue: all healthy babies learn to walk when they're ready for it. Learning to walk is a process. Initially, toddlers rock from side to side – a real “duck-walk” imitation! In an attempt for balance, toddlers walk with straight legs slightly spread apart, the feet pointing outwards and with fisted hands turned outwards. Once feeling safe, babies bring their legs closer together, point their feet forward and release the previously tense arms and hands, putting them to the sides of their bodies.Stopping is no less an acquired skill than starting – babies gradually learn to stop and change direction. Learning to walk naturally entails a fair amount of falling, which makes for an important learning experience. As hard as it may be, when your baby falls, gauge the situation and intervene only if help is really needed. Sitting and climbing come with the territory too. 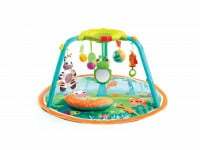 Toddlers can now sit themselves on a small chair – relaxing or playing. 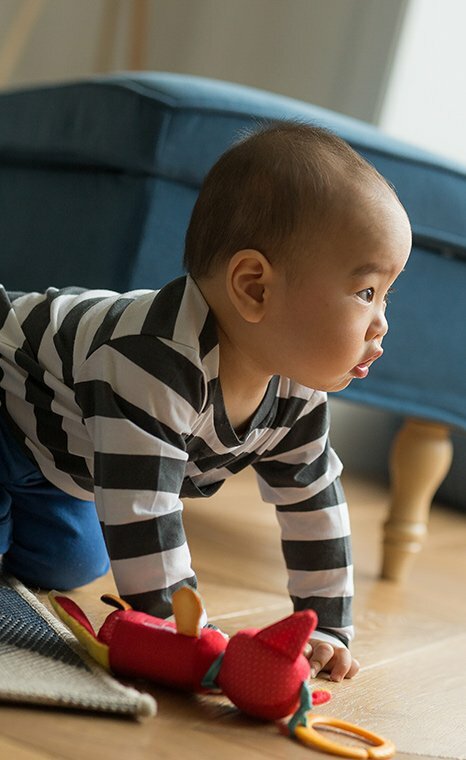 Climbing stairs is an intriguing activity: at first, toddlers climb steps one step at a time, with both feet resting on a single step; they descend in a backward crawl. Stands on her own for several seconds and walks around a table holding on. Helps when you dress her. 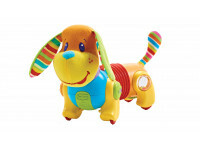 Many babies take their first steps and even walk while dragging a pull toy. Throws a ball with two hands. There is absolutely no better training ground for strengthening the muscles in your baby’s feet and improving balance than a barefoot trek through soft sand. Let your baby walk barefoot as much as possible. 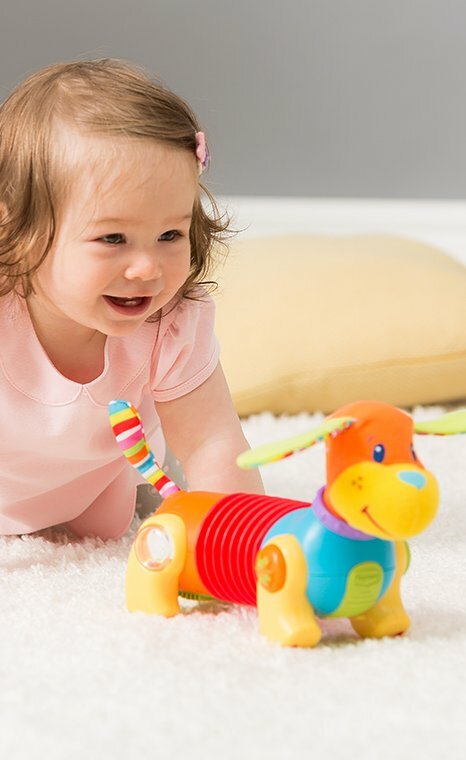 Both gross motor skills and fine motor skills are what enable all of us - babies, toddlers, children and adults - to be physically active and control our bodies. 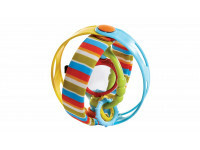 While your baby’s motions may seem random and uncontrolled, control over his limbs develops gradually.